PINE BELT (WDAM) - The double-deck-weather-maker is still expected to sweep across the Pine Belt during the day on Saturday. 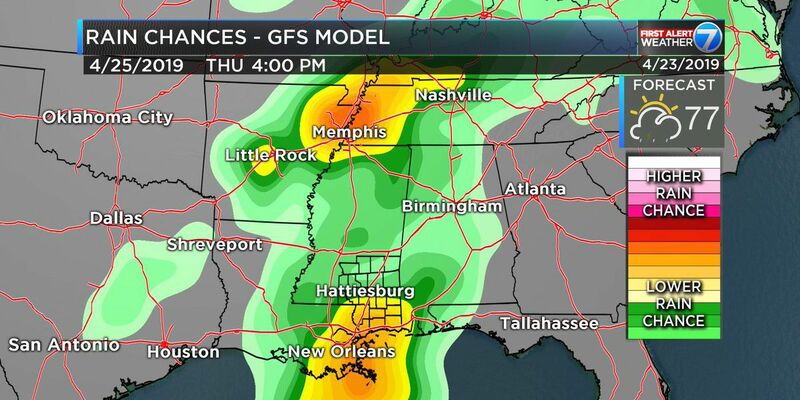 The first round will feature strong-to-severe storms with the potential for heavy rain, wind gusts exceeding 65 mph and the potential for a tornado. Round 2 will be a push of some pretty cold air, dropping temperatures on Saturday night from 70 at lunch to around 40 by midnight. The Storm Prediction Center has highlighted our area with a Slight Risk for severe weather on Saturday. Showers and storms will be possible Saturday. This may include the threat for some severe storms, too. Right now, the main threat will be heavy rain, frequent lightning, gusty wind in excess of 65 mph, hail and the possibility of a tornado. 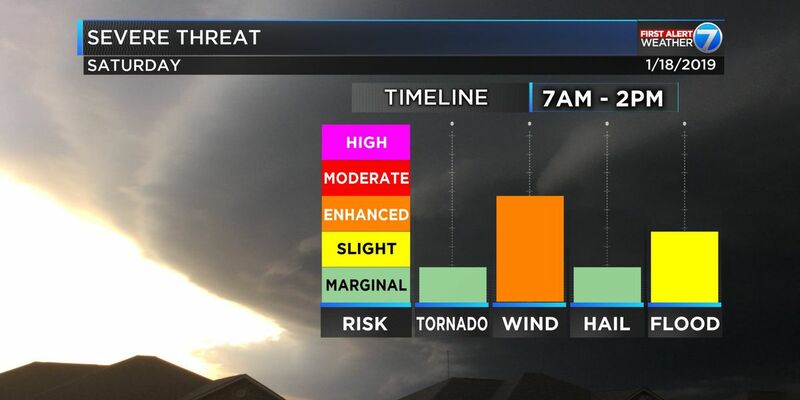 The main threat for storms will be in the morning through early afternoon. While not every storm will be severe, most storms will likely pack a pretty decent punch with, at least, 30 mph wind. Behind that, cooler air will push into the area on Sunday and Monday. Highs will be in the 40s and 50s with overnight lows in the 20s and 30s. It looks like Sunday will be quite chilly with temperatures hanging int the 40s most of the day with a northwest wind at 5 to 15 mph with gusts to 25 mph possible. That will make it “feel” like the 30s for most of the day. Then overnight Sunday and into Monday the area may be below freezing for up to 10 hours. Have your NOAA Weather Radio programmed with fully charged batteries available for it. If you must travel, make sure to check the weather conditions, watches, warnings and advisories before venturing out the door. Review your Severe Weather Plan and know what you would do if a severe storm or tornado was near you. If you don’t feel comfortable riding out a storm where you live, make a plan regarding when you would leave your home and where you would go. Also, download the WDAM Weather App so, if the power goes out, you still have access to live, streaming coverage of any updates about the weather. Check your pipes now, before it gets cold. Insulate exposed pipes and double-check those pipes you may have insulated earlier in the year. Heavy rain, lightning, and gusty wind in excess of 65 mph possible on Saturday. Followed by much colder air on Sunday and Monday. Right now, it looks like the first rain and storms will arrive Saturday morning and linger into the early afternoon. The cold air arrives Saturday night and into Sunday morning and hangs around through Monday afternoon. We don’t know, specifically, where the severe weather will be. Everyone in the area is “fair game” for a severe storm as of now. How cold the air will be behind the rain due to the trajectory of the front and how much snowpack will be left in the Midwest from this last weekend’s snowstorm. For more scientific information on this and other forecasts, you can get a complete scientific breakdown over on Nick’s Blog. 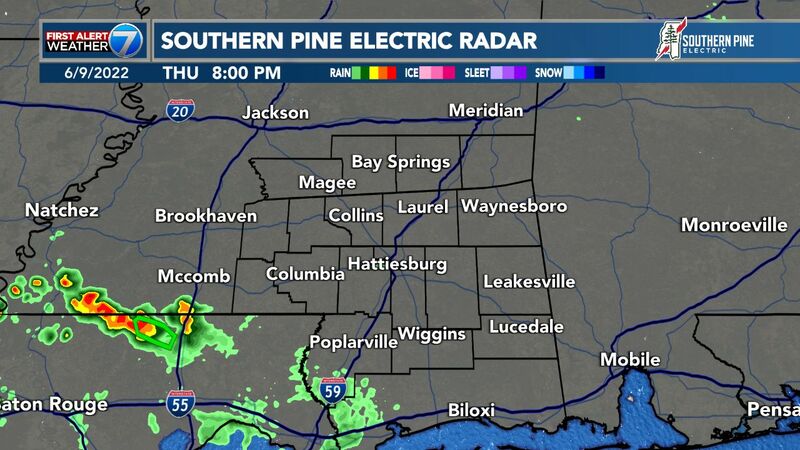 Also, continue to check WDAM.com and catch WDAM broadcasts for the latest updates on weather developments.